For the past few weeks, the Fortnite community has been watching the race to 100,000 kills. As several players edged their way towards the milestone, two clear frontrunners eventually emerged: streamers Ninja and HighDistortion. Last week, the pair were split by less than 100 kills. With 3000 more games played than Ninja, perhaps it’s not surprising that HighDistortion would be sitting very slightly ahead, although it’s testament to Ninja’s ability that the race would be so close. Last week, however, the streamer announced that he would be sitting out the rest of the race to let HighDistortion reach 100,000 eliminations first. In a recent tweet, Ninja said that he was “taking a break and giving up on the race to 100k,” citing his opponent’s 30-hour streams as one of the reasons for bowing out. At time of writing, FortniteTracker shows that HighDistortion has widened the gap significantly, with 98,533 kills to Ninja’s 97,586. With more than 4,000 kills between first place and the next closest competitor, it would seem that HighDistortion’s victory is all but guaranteed. At present, the race to 100k is just a fan-made milestone – as far as we’re aware, there’s no prize on offer, just a sense of pride. That said, it’s very possible that Epic will make some sort of in-game reference to the feat. Ninja’s decision to abandon the race may come down to the fact that he already has a major Fortnite milestone under his belt. 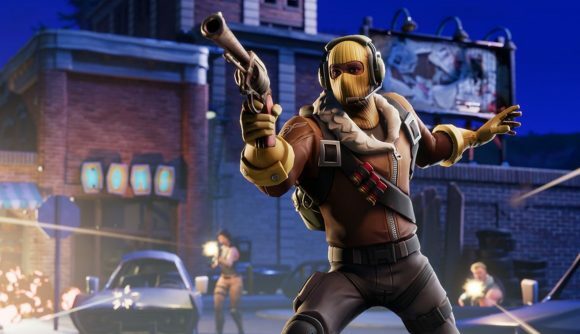 Last year, the streamer became the first Fortnite player to secure 5,000 victory royales, securing a mind-boggling 37% win-rate along the way.